A tip of the hat to the excellent Go Feet blog for uncovering another marathon-running pop star to join the likes of Johnny Marr, Bernard Butler, Joe Strummer and Bjorn from ABBA. And this time we may have found a decisive winner in our quest for the fastest marathon in pop history. Step forward Stuart Murdoch, singer and main force behind excellent Scottish indie favourites Belle and Sebastian, who has been a runner since his youth. Murdoch’s running credentials are impressive – schools athletics, half-marathons and a regular running habit. 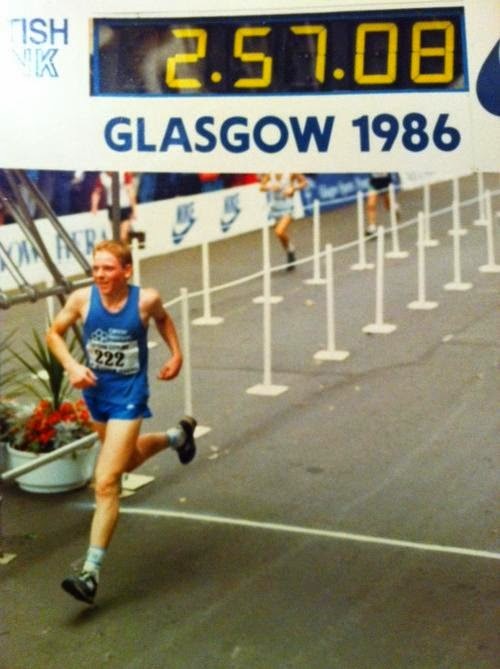 But all you really need to retain is the astounding fact that, as per Go Feet, Murdoch ran 2:57:08 in the Glasgow Marathon in 1986: a sub 3-hour time when he was only 17. Running a marathon while still a schoolkid is notable in itself – back in the 1980s marathon running was considered something for older runners who had worked their way up through the standard track distances. But clocking a sub-3 at that young age shows commendable mental and physical stamina in one so young. So much for the fey, twee image of Belle and Sebastian. In an interview (subscription required) with the Scottish newspaper The Herald in 2005, Murdoch said that he hasn’t run a marathon since then but would like to, despite ongoing Achilles tendon problems – and he had to give up a place in the New York Marathon due to recording commitments. A quick glance through the Belle and Sebastian discography reveals a couple of songs with a running-related title – The Loneliness Of A Middle Distance Runner and The Stars Of Track And Field. And if you want to see Murdoch in running action, here’s the video to Belle And Sebastian’s 2004 single I’m A Cuckoo, in which he runs on the streets of Glasgow. UK athletics fans will recognize the coach in the video as Scottish sprinter Allan Wells, 100 metres champion at the 1980 Olympics in Moscow, showing his gold medal to Murdoch. This entry was posted in Marathon and tagged music, running. Bookmark the permalink.